This sport of H. 'August Moon' was registered in 1986 by Dr. Charles Purtymun at Walden West Nursery in Oregon. The plant grows to a large size about 26 inches in height with a 55 inch spread. Its leaves are green with a yellow marginal variegation. They are moderately corrugated with above average substance. The pale lavender flowers bloom from July into August. According to The Hostapedia by Mark Zilis (2009), "...ranks as the firs significant "Abiqua". It is also the first green-centered sport of 'August Moon'...it can serve as a non-burning replacement for 'Frances Williams'." 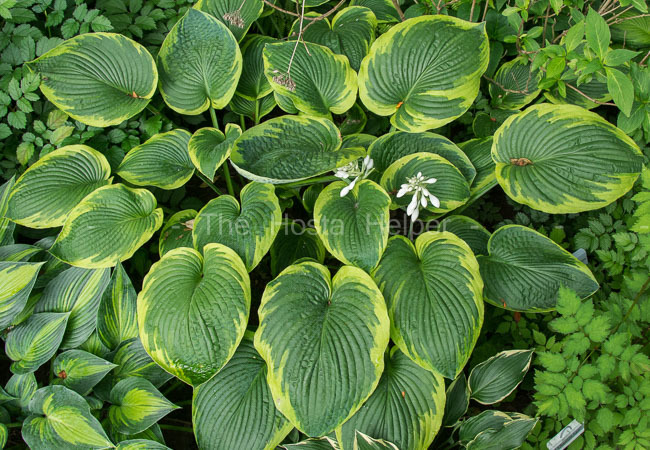 The New Encyclopedia of Hostas by Diana Grenfell (2009) states: "Leaves emerge yellow, the center gradually turning green."